TORONTO — Nashville Predators star defenceman P.K. 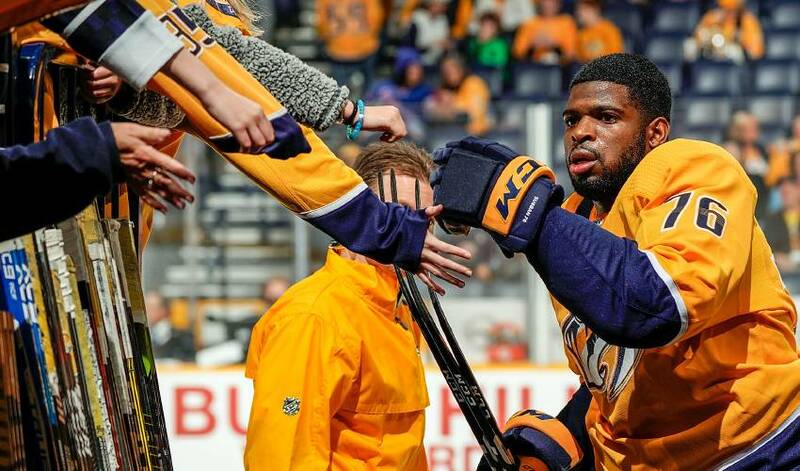 Subban has reached out to a teenage hockey player facing racial abuse. Subban, a Toronto native, recorded a video and sent it by text to a 13-year-old Detroit-area hockey player last week. The teenager's parent shared the video, recorded in Detroit during the Predators' visit to the city last week, on Reddit. "I can tell you this right now: As long as you're still breathing in this world, you've got to believe in yourself and let nobody tell you what you can and can't do, Especially if it's because of the colour of your skin," Subban said. The parent, with the user name hockey7676, says the teenager has asked for a Subban Montreal Canadiens jersey when he was six and wears the same No. 76 as the player. "This year has been tough," the parent wrote. "My son is very aggressive and loud, so that brings out the trash talk. I have no problem with trash talking at all (part of the sport), but the racist talk needs to stop. Between the N-word being thrown at him over and over, being called monkey by players and parents, having an entire team beat their chests and act like gorillas whenever he touched the puck, and being told he should be lunched by former teammates.